Mount Pleasant Granary - Comments - Wednesday 11th. March, 2015 – Lots of Fun! You can see from this picture that the shelves are filling up now – and there are still so many boxes yet to unpack! Walked Mix – I saw the Robertson’s of Duns bus that hit me yesterday, but today I was on the other side of the road because I had moved over to get around the one blind corner or our route. Surprised that they still haven’t contacted me. While we are breakfast Tom arrived and we set off for Cranshaws to collect hymn books and to check out the manse. On the way home we dropped the hymn books into Stephen and then came back to Mount Pleasant. Soon afterwards David set off for Berwick to collect the tyres for the trailer and we all met up at Gavinton Church Hall were we joined in the soup lunch. It was very good, I particularly enjoyed the green soup (broccoli and stilton) and the blue cheese. I came back to Mount Pleasant while Tom and David went off to buy a new cooker for the Church Hall. My afternoon task was to load some more boxes into the Bothy and to unpack them. It was a good afternoon’s work and the shelves are already beginning to fill up. 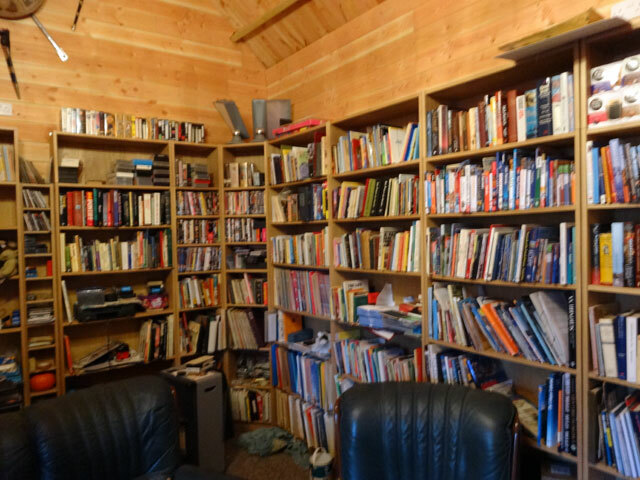 I dined with the family in the farmhouse and then Mix and I came across to the Bothy where I sorted out the DVDs and tapes (and sorted out my accounts as well). Later I caught up with the News before bed. Today we received a small double sheet newspaper called the Berwick News which was issued by Michael Moore. I was quite taken aback by it. Even although in tiny print on the back it said that it was published on behalf of Michael Moore, it still felt it appropriate to announce in much bigger print that the Berwick News was supporting Michael Moore, giving the impression that this was an objective decision it had come to and that it was in some way an independent view. Even worse was the poll which it published suggesting that only the Liberals could stop the Conservatives in this constituency. It suggested that 45% were in favour of the Liberals, 34% were in favour of the Conservatives, 10% in favour of SNP and 9% in favour of Labour. Nowhere (and I searched very carefully), did it say where these figures came from, or what polling sample had been taken and from whom and when. It was just announced. This is particularly surprising because one can go to the website of Electoral Calculus (who have been predicting election results for the last twenty years, who use sophisticated polling methods and who came closest of anyone to predict the seat by seat results at the last election) and find a very different picture painted. This is from their web-site: Liberal 20.4%, Conservative 33%, Labour 2.6%, SNP 34.9%, UKIP 5.1%, Green 3.9%, Others 0.2%. In other words Electoral Calculus after absorbing all of the myriad polls and using proven methods to reach their results agree that there will be a tight battle but sees quite clearly that it will be not between Liberals and Conservatives but between Conservatives and the SNP. Against that background it is hard not to see some dishonesty in the claim that only the Liberals can defeat the Conservatives in this seat. It makes me wonder what sort of people politicians imagine us to be (and also what kind of people they must be to endorse such misleading tactics). And a final word, Electoral Calculus reckons that the chances of each party winning this seat are as follows: Liberal 9%, Conservative 35%, Labour 0%, SNP 56% and the other parties 0%. That may all change – but it would be wrong were it to change because of wrong polling figures which are presented as truth with no kind of basis in fact at all. That’s my rant for today. (You can find electoral calculus at www.electoralcalculus.co.uk).